This glass stem with bowl from Ehle is an example of the high manufacturing quality and the adjustment of Ehle. All parts from Ehle are handmade, therefore the length of the stem may vary. Certainly we take care with new orders that the individual parts fit. 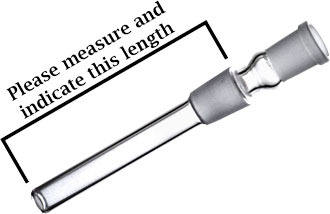 However, if you already have a waterpipe, please specify the exact required length from top edge (insert) to avoid complications. How do I measure the correct length?